The 2015 Kalacha Festival: Can Anything Good Come Out of Nazareth? Most people in any given society tend to buy anything the media propagates as the gospel truth; and this has not been any different for the Northern Kenya region. Violence between pastoralist communities over grazing lands and water resources has been at the centre of media coverage, both locally and internationally. Thus the image most Kenyans and the rest of the world have about this region is a tainted one. This makes it hard to retell the story of this region. Though there is much good in this region it remains unreachable, unbelievable and/or doubted- like Nathaniel many would question the existence of a bright side: can anything good come out of Nazareth? However, if one stared at the back of the moon they would realise that it too shines. The people of Northern Kenya are beautiful in their diversities, as is the landscape despite it being arid. Organisations such as the Kivulini Trust have taken it upon themselves to showcase this often hidden bright side of the region. The Kalacha Cultural Food and Music Festival, an initiative of the Kivulini Trust, is one of these ‘shines’. For the past four years this event, which has become part of the Northern Kenya calendar, has brought together pastoralists, fisher-folk, hunter-gatherers, metal artisans and agricultural communities of the region (and Ethiopia) to share and celebrate their cultural and natural heritage, with an aim to promote cultural diversity, social harmony and sustainable development. This festival showcases the diversity of the region’s rich cultural and natural heritage through artistic expressions, exhibitions of traditional foods, medicinal plants and demonstration of technology, including rock art at the Afgaba site. The number of the communities represented was over forty and these include the Gabbra, Rendille, Borana, Somali, Konso, Garri, Burji, Saakuye, Samburu, Waata, and Turkana among others. It was amazing to see the proud display of both tangible (e.g. ornaments and traditional attire) and intangible (e.g. songs and dances), culture by the diverse communities. Also unforgettable was the relentless call by various speakers from the communities to live in harmony and peaceably with one another, especially during crises such as drought when crucial resources, water and pasture, are more scarce. The festival not only showcased present communities’ cultures but past ones as well. On the final day of the festival, participants had the opportunity to go on a guided visit to Afgaba rock art site. Mr Abdikadir Kurewa of the National Museums of Kenya and TARA’s Hanna Söderström led the team that visited the site. The rock art which is all engravings comprises representations of animals such as the camel and the giraffe. There are also circular engravings similar to those that are associated with rainmaking rituals in some communities. This artwork reveals the ingenuity and the imagination which the now disappeared artists had. Situated at the rock art site is a natural water tank into which surface run-off drains. One can imagine what view the artists who made the rock art saw. From this water tank the pastoralists water their animals. Despite this rock art site being located in the region, very few people know about it and the few that are aware of its existence don’t know its significance. TARA (Trust for African Rock Art) therefore, took part in the festival to raise awareness of this kind of rock art and to help people understand the importance thereof. Just like the cultural traditions which the present generations have received from their forefathers are heritage, so too is the rock art. The rock art site visit was aimed at raising awareness but unfortunately very few from the local communities took part in the fully sponsored trip to the site. The closing ceremony was another spectacular highlight of the festival. 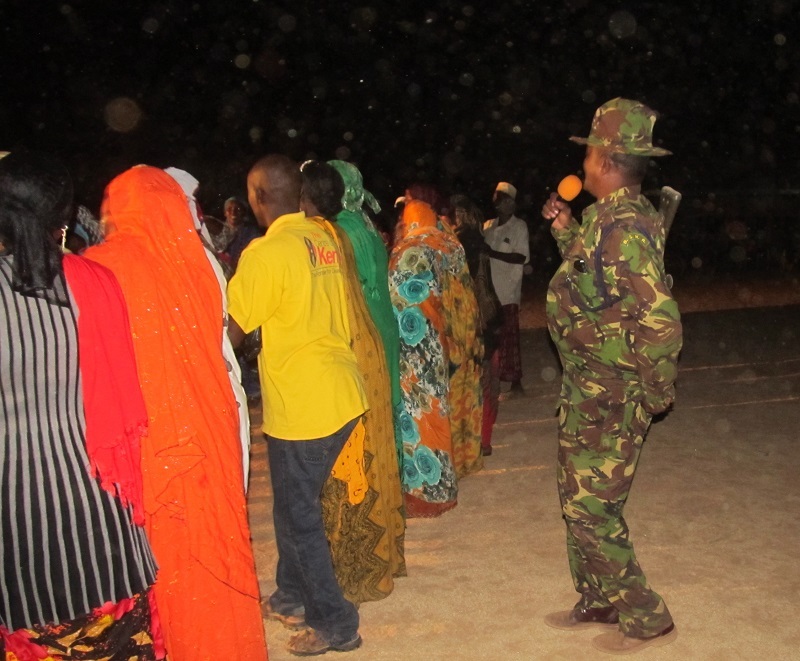 At some point during the closing ceremony, one of the members of the armed forces present, infull attire including rifle hanging on his shoulder, ledone of the traditional songs while others danced in a circle. Again whenever a certain community (e.g. 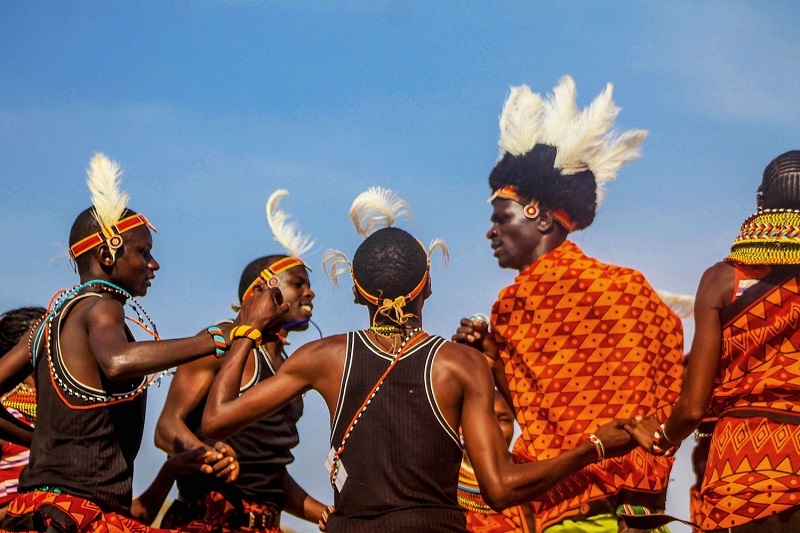 the Turkana) was called to perform on stage, members of other communities joined in to sing and dance together while they held hands. It is as though they were shouting aloud for the whole world to hear their resolve to embrace each other and live harmoniously and peaceably with each other despite their differences, even the cultural ones, by their actions. Yes, it is true that there has been violence between communities of this region, but that’s not all that there is, there are bright moments too. Taking opportunities such as the annual Kalacha Festival, and others, would help adjust one’s perspective a little in order to see the back of the moon shine.